"Indian Council House, at Glen Iris"
This view was taken on the Council Grounds sometime in the mid 1880's by a local photographer probably hired by Mr. Letchworth. The Caneadea Council House is in the center, with the Jemison markers to the left. 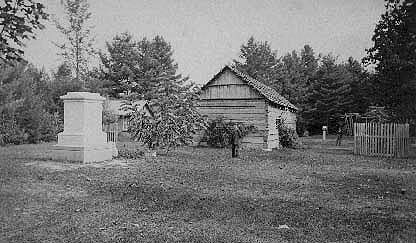 Note that both the original gravestone and the one Mr. Letchworth erected are visitble. Several Memorial Trees are visible, including the one near the grave. A black walnut was originally planted at the spot by Mary Jemison's grandson "Buffalo" Tom Jemison. That tree died and was replaced by one planted by James Shongo, another grandson. It is not known which tree is shown in this photograph. The small building to the left of the Council House was the entrance lodge for the Grounds. For more information, please see A Glimpse of the Council Grounds.